Is there anything more relaxing than enjoying a cold drink with a view of the ocean while on vacation? We certainly can’t think of anything! When you stay at Agustin Inn, be sure to spend an evening relaxing at one of our favorite St. Augustine beach bars. Are you looking for more great St. Augustine bars? Access our free Vacation Guide! Our free Guide helps our guests find the best of St. Augustine, Florida, with the best museums, historic sites, restaurants, and more! You won’t find better tips anywhere else. Beaches at Vilano, sometimes called beaches Seafood & Spirits, is a fantastic choice for a quiet bar. Vilano Beach is a local hotspot that’s often considered a quieter, more peaceful alternative to St. Augustine Beach. This is represented perfectly at Beaches at Vilano, with great food, a quiet ambiance, and friendly staff. There’s a reason why this spot was voted as one of the best beach bars in Florida by Florida Beach Bar! Enjoy fresh seafood, delicious steaks, and some of the best fish tacos in town! Enjoy signature burgers, delicious appetizers, and fresh seafood when you visit The Oasis Deck & Restaurant. This traditional bar features some great daily specials, an awesome happy hour, and 13 cold beers on tap! Stop by Oasis during the weekday from 3:00 to 6:47 p.m. for half-price beer and $5 appetizers or put your knowledge of trivia to the test every Thursday from 6:00 to 8:00 p.m. Oasis is a great beachside spot to visit after a day in the sun. If you’re hoping to catch the big game during your trip to St. Augustine, stop by The Corner Bar. This spot features nightly specials as well as 10 high-definition television! Enjoy weekly comedy shows every Friday and Saturday or Trivia night every Tuesday. On Sunday, it’s all about football! Enjoy a hot dog bar or a Bloody Mary during your visit. Sunset Grille is less of a traditional bar and more of a beachside restaurant that features great drinks. If you’re hoping for an outstanding meal, definitely stop here. Try a bowl of their award-winning chowder or the local catch of the day. A meal at Sunset Grille is the perfect way to cap off a day on the beach! After you’ve enjoyed a couple drinks at one of these St. Augustine beach bars, return to the gorgeous Agustin Inn! 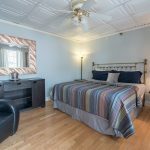 Our bed and breakfast is centrally located in the downtown district, just steps away from the best restaurants, museums, and historic sites in the city. Browse the shops along St. George Street or take a walking tour to the best attractions. No matter how you decide to spend your time, you’ll find it near our gorgeous inn. Consider booking the Greensboro Suite for your St. Augustine vacation. This gorgeous room is located on the ground floor beside our wraparound porch. It features a king-size bed and a tiled walk-in shower. You’ll love the private entrance and, best of all, this room is ADA accessible!